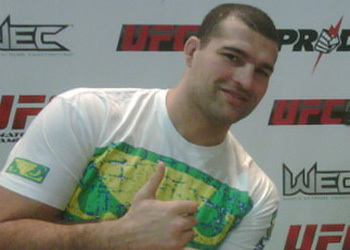 The Gambling Gods don’t give Mauricio “Shogun” Rua much of a chance at successfully defending his freshly minted light heavyweight crown at UFC 128, so ESPN’s Sports Science wanted to see if they could discover why. The lab geeks hooked the Brazilian up to several high-tech devices in order to measure the viciousness behind his strikes. According to their tests, Shogun’s right punch accelerates at 25mph and packs 1,169 pounds of force behind it. While those numbers are staggering enough to cause most to scream in fear like a little school girl, the champion’s right kick is accompanied by a whopping 2,749 pounds of force. According to Sports Science, that’s the hardest single-strike any athlete has ever registered in their laboratory. UFC heavyweight champ Velasquez’s takedowns clocked 2,700 pounds of force this past October. Shogun puts his title on the line against fast-rising superstar Jon Jones this Saturday inside the Prudential Center in Newark, New Jersey.